Belize snorkeling tours and Caribbean snorkeling are always accompanied by our Atoll Adventure Guide who is a master naturalist and marine eco-tour expert. Explore all of the wonders and the beauty of the Turneffe Atoll, including the finest reef snorkeling in the entire Caribbean. Our unique marine eco-adventure experience features world-class snorkeling, birding, wildlife sightseeing, plus several other fun and informative activities. If so inclined, you also can stay at the resort and lounge at the pool or on our beach. Every day offers both a great new adventure and a perfect opportunity to relax - that's what our Atoll Adventure is all about. Atoll Adventurers choose from a variety of daily guided activities led by Abel Coe or another experienced Atoll Adventure guide, all of whom are informative and fun. Our 25-foot canopied boat is at your guide's disposal for exploring the reefs, mangroves, creeks and lagoons that make Turneffe the largest and most biologically-diverse atoll in the Caribbean. Turneffe's warm Caribbean waters, extensive sea life and vibrant corals make snorkeling one activity that you will definitely want to experience. Our guides are masters at helping everyone feel comfortable in the water and beginners can learn to snorkel on our sandy shore before visiting the reef. With at least 60 species of birds at Turneffe, birding is another highlight. You may also want to tour the atoll looking for manatees and dolphins or enjoy an afternoon kayaking. Our Atoll Adventure Program is a very flexible and is tailored to fit the particular interests of each group. Our lead Atoll Adventure guide, Abelino "Abel" Coe, was born and raised in a Mayan community in Southern Belize and his first language was Maya. Abel is an avid student of Mayan history and he is well-versed in Belizean history. Days with Abel are informative and fun. He knows the flora and fauna of Turneffe intimately and is very adept and finding all of the interesting things one would otherwise miss. 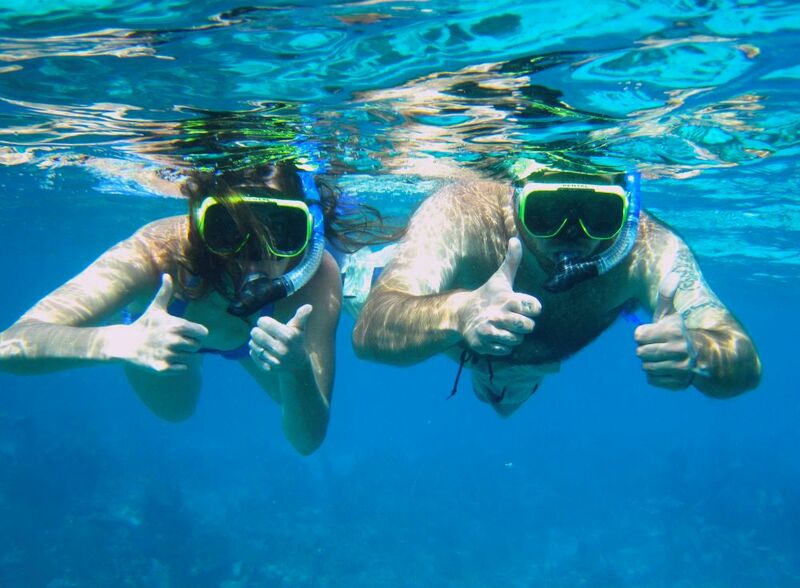 Abel is an excellent snorkeler and makes his guests feel comfortable visiting the underwater wonders at Turneffe. Approximately 30 miles long and 10 miles wide, Turneffe Atoll is the largest of only four coral atolls in the Caribbean. Two others (Lighthouse Atoll and Glover's Atoll) are also located in Belize and the fourth is in Southern Mexico. Formation of these coral atolls was accomplished through years of coral buildup rather than by volcanic activity - the more common mechanism of atoll formation. The entire Atoll is surrounded by a fringing coral reef with waters inside the reef varying from less than a foot deep to 30 feet in depth. Ocean depths around the atoll are thought to reach 10,000 feet. Turneffe has evolved as a model coastal marine ecosystem with interrelated habitats including the coral reef, the back reef flats, the sea grass beds, the mangroves and the littoral forest. During your visit you will learn how all of these varied habitats are interrelated and interdependent. Ultimately, we hope that you will agree that the unique and special environment of the Turneffe Atoll warrants protection from threats such as over-fishing and improper development which have decimated much of the coastal ecology in other parts of the world. Turneffe Atoll offers multiple world-class snorkeling sites and our guides know all of them well. You can expect to see a wide variety of tropical reef fishes, rays, sea turtles, lobsters, dolphins and possibly manatees. While snorkeling, you will always be accompanied by one of our experienced Atoll Adventure Guides who are masters at helping even novice snorkelers feel comfortable in the water. They will make sure that your equipment fits and will teach you the best snorkeling techniques. They know where to find all of the interesting creatures and will ensure that you make the most of your snorkeling adventure. Turneffe is home to a population of West Indian Manatees which grow to 1,300 pounds and trundle along the seagrass beds browsing on seagrass. Their only living relative is the elephant and they have remnants of toenails on their front flippers. These shy creatures can be seen in several of the creeks and channels around Turneffe Atoll. More than 60 species of birds have been identified on the Turneffe Atoll with the following seen commonly: snowy egret, little blue heron, great blue heron, tricolored heron, yellow-crowned night heron, clapper rail, mangrove swallow, brown pelican, magnificent frigate bird, double-crested cormorant, osprey, mangrove warbler, great tailed grackle, golden fronted woodpecker, tropical mockingbird, cinnamon hummingbird, green breasted mango, hooded oriole, white crowned pigeon and royal tern. Seen on occasion are: the belted kingfisher, white-eyed vireo, northern water thrush, barn swallow, peregrine falcon, merlin, common yellowthroat, bay breasted warbler, red-eyed vireo, palm warbler, Cape May warbler, eastern wood pewee, summer tanager, brown booby, Yucatan vireo, American redstart, least tern and the roseate tern. Just inside the fringe reef along the seaward side of the atoll are miles of shallow, gin-clear flats. This is the area where fly fishing anglers search for bonefish and permit. In fact, the "flats" are alive with sea creatures of all sorts. With a discerning eye and the aid of your guide, you will likely see schools of bonefish, permit, trunk (box) fish, barracuda, small rays, snappers and even small sharks. In the surf you can sometimes see large parrot fish or trigger fish with their backs half out of the water. Most of the flats are covered with lush turtle grass which is a key habitat for many species of juvenile fish. The flats are also vital in protecting the coral reef by acting as a sediment filter.